India’s wholesale inflation rate inched up to 2.93 percent in February, compared to 2.6 percent in January, driven by costlier vegetables that had seen prices drop sharply over the last few months as a bumper seasonal harvest flooded the mandis. Latest price data released on March 14 showed that wholesale vegetable prices grew 6.82 percent in February compared to a fall of (-) 4.21 percent in January and the 15.26 percent in February 2018. Overall wholesale inflation rate was 2.74 percent in February 2018. Pulses, the most common source of protein for millions of Indians, have also become costlier in mandis, the data showed, with wholesale inflation in pulses growing 10.88 percent in February, compared to 7.55 percent in January and (-) 24.51 percent in February last year. Overall food inflation rate also edged closer to 5 percent. It was 4.28 in February this year compared to 2.34 percent in the previous month and 0.95 percent in the same of last year. “The rise in vegetable prices are on expected lines. Going forward, food prices are expected to rise sequentially but there will not be a sharp rise. So the room for a rate cut by the Reserve Bank of India still remains,” said Tushar Arora, senior economist, HDFC Bank. Potatoes have also become dearer compared to a year ago with wholesale potato prices growing 23.40 percent in February. It grew 26.30 percent in January and the 11.67 percent in February last year. 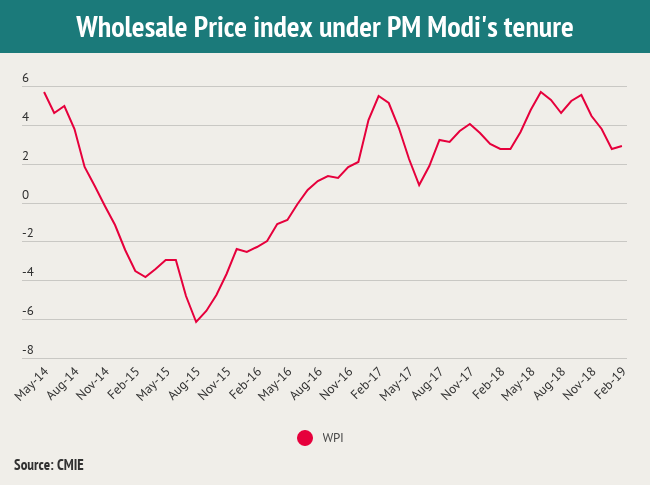 Manisha Sachdeva, Associate Economist, CARE Ratings, expects wholesale inflation to move upwards in the coming months driven by rise in the prices of food articles and manufactured products. “Oil prices too are likely to increase in the coming months, which will further exert an upward pressure on the prices. It will cross three percent in March and be in the 3-3.2 percent range,” she said. India’s agriculture sector is currently caught in a peculiar flux. Good harvests have helped keep bottle up the overall inflation levels but have also implied that farmers’ income have remained flat or not growing at rapid clip, as wholesale prices serves as a gauge to measure the prices that farmers are getting for their produce..
A bumper winter-sown crop, that had flooded mandis, had resulted in a price crash. Without many buyers, the glut had forced farmers to dump products at throwaway prices to clear up a piling mount of vegetables. Rural distress caused by falling or stagnant farm incomes have snowballed into a major political issues ahead of the Lok Sabha elections to be held in April-May. The Opposition has charged the government of failing to protect farmers’ interests by not ensuring a rise in their incomes. Protesting farmers across many states have been emblematic of the structural problems afflicting India’s agriculture sector, with farmers saying their incomes have risen barely enough to cover to rising input costs such as fertilisers and seeds. The Bharatiya Janata Party (BJP) has lost power in three crucial heartland states—Madhya Pradesh, Rajasthan and Chhattisgarh—in Assembly elections in December, with analysts attributing the loss primarily to the ruling government’s inability to address farmers’ concerns. Several states including Madhya Pradesh, Uttar Pradesh and Punjab have waived off bank loans for farmers to help them deal with the immediate income crisis. The Centre, in its Interim Budget last month, announced a new scheme to transfer Rs 6000 a year directly to small and marginal farmers’ bank accounts. The first tranche of this transfer is currently taking place. An estimated 120 million farmers owing about 2 hectares of land will be eligible for this scheme that will cost the Centre Rs 75,000 crore a year. Prices of fuel and power, which together have a weightage of 13.15 percent in WPI, grew to 2.23 percent in February, as against 1.85 percent in January.